Eiffel Tower – the most recognizable icon of Paris and France is 324m (1,063 ft) tall and is visited by almost 7 million people each year. Fun fact – it was initially criticized by artists and intellectuals of France. Well, they all were wrong. Notre Dame de Paris – a very beautiful medieval Catholic cathedral and one of the best examples of French Gothic architecture. Believe it or not, but the construction of this piece of art was completed in 1345 – almost 7 centuries ago. Pont Alexandre III – an arc bridge over the Seine river, is considered the most extravagant bridge of the city. 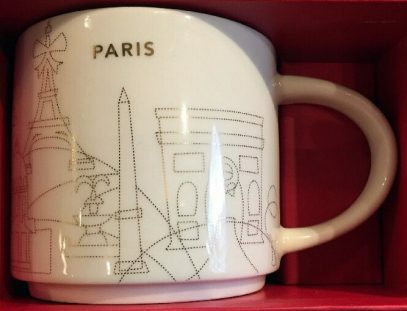 As any Christmas YAH this mug will be a hard to find one because of the limited production. If you see it, buy it, you won’t regret.